Thank you for visiting the official blog of Fenom Kimonos®! The purpose of this blog is simple – to deliver content related to what we believe in, who and what we are involved with, and introduce you to some of the cool products that we produce for girls and women in Brazilian Jiu-Jitsu. We are grateful for your time, and we are looking forward to hearing from you. Can you recommend any bjj podcasts made for or with women? The few that I’ve found are inspiring and offer more helpful tips than the average videos with men. I’ve really enjoyed your blog, website, and facebook page. It’s refreshing to see so many happy, healthy women training in BJJ. I recently purchased your white lotus gi. I believe it to be the best gi that I’ve ever owned, and with over ten years experience in martial arts, I’ve owned a lot of gis. I like the soft material, strong construction, fit, and the elegant styling. You should lookup Jocelyn Chang at Let’s Roll in Torrance, CA. She was one of the first American girls to receive a black belt in BJJ. She is a breast cancer survivor. 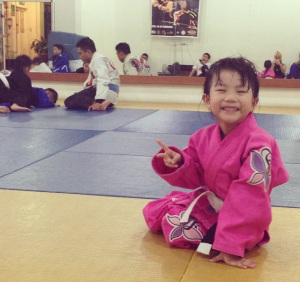 BJJ helped save her by giving her the courage and strength to get through the operation, chemo, and, radiation. She is a true warrior. Thank you for your interest. Can you send us an email to info@fenomkimonos.com and we will feature your daughter?